Four Southern Pacific SD45-T leads a stack train over the Donner Pass route. The route goes from Roseville, California to just east of Sparks, Nevada which is 142 miles. 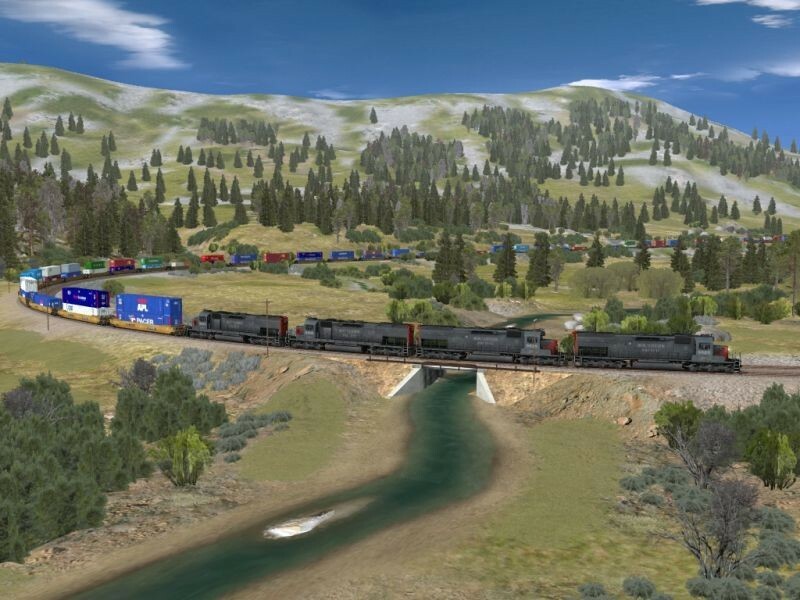 The route is payware which is available at TrainZItalia. However, You need to have Trainz 12 and build # 61388 installed in order to run this route. The route will not work in any other version of Trainz or any other builds. Also, Please be aware that I would not recommend this route if you have a low end computer as the route uses HD textures. However, I have to say that this is one of the best routes I have ever seen in Trainz when it comes to detail and I would recommend this route to anyone. Here is shot # 9 of 9 of the Roseville, California to Truckee, California portion of the route. Added to the photo archive by Randy Dyer, January 11, 2015.